“I love dahlias, but I don’t have the space to overwinter the tubers, so I grow these annual ones. 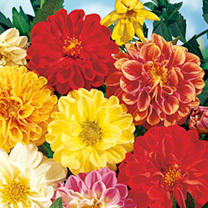 The blooms come in a multitude of colours, with both double and semi-double plants. They’ll provide you with a gorgeous autumnal display in the garden or a vase.” Height 40cm (16”). HHP - Half hardy perennial. Sow in a propagator on a windowsill or in a greenhouse at approximately 15-20ºC (60-68ºF) using a good quality, moist compost. Cover the seeds with 6mm (¼") sieved compost and keep moist. Germination 5-20 days. Transplant seedlings into trays or singly into 7.5cm (3") pots and grow on. Acclimatise plants gradually before planting out when all danger of frost has passed, 35cm (14") apart. Choose a sunny open position. Ideal for beds and borders, and for cut flowers. Prefers full sun.